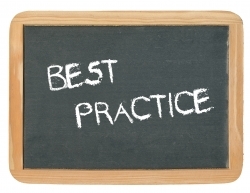 How many times have you heard the term ‘best practice’ uttered at a Board meeting, a workshop or a conference presentation? Too many, I am afraid. In a profession enamored with buzz words, this one gets used with the frequency of ‘awesome’ and shares the same shallowness. The term best practice is used like a master key. You just need to invoke it and the draw bridge comes down, and everything opens. But ‘best’ according to whom and in relation to what? How can anything be a ‘best practice’ when it is void of social, cultural, and historical context? Is best practice in a Baltimore middle school the same as one for an American school in Barcelona? Can a best practice ever become a bad practice or a mediocre one? It’s not that I doubt that there are many unique and effective practices out there, it is just the use of the superlative that makes me squirm. Best practice has a way of designating itself as superior by virtue of being a best practice. The logic is circular. The problem with ‘Best’ is that it comes off as imperial. It leaves no room for alternatives. It eschews variety, gradations and plurality. Why not call these emerging practices? We never talk about the change of seasons or a savory meal as best. Isn’t all effective education something that is fluid, protean and evolving? Like our omnipresent ear phones and head phones, we should have our critical antennas up whenever the word is uttered. The superlative is a tense that does not belong in education. Rather, let’s take the work or program in process, the draft and the evolving idea. It feels more authentic, resembling the messy and often improvisational nature of life in school. Best practice connotes white coats and flawless data. Emerging practice signals something iterative, evolving, and like our students, in a time zone of constant adaptation. We should care as much about language and how that shapes our perceptions as we do our test results.